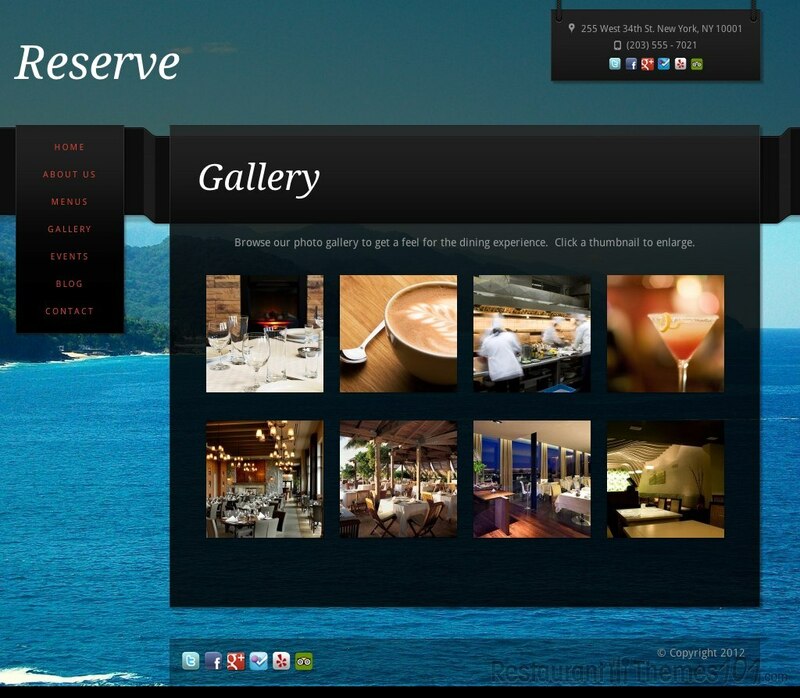 Reserve is a WordPress restaurant theme developed by Restaurant Engine. 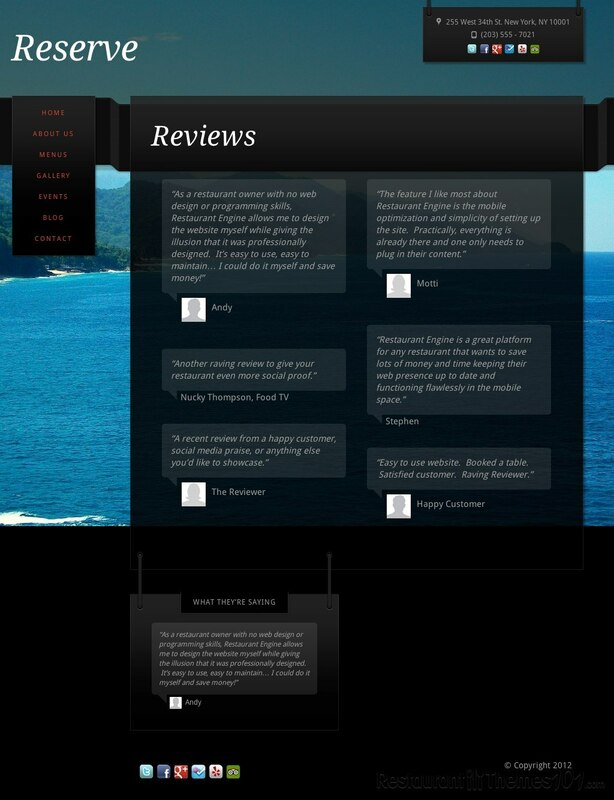 The design of this theme is very elegant and an absolute eye-candy for all of your visitors. It has a unique style with carefully and professionally created eye catching details mixed with full-screen imagery. This classy design will draw any visitor’s attention and leave them hungry for more of your great looking website, as well as for your nicely presented cuisine. 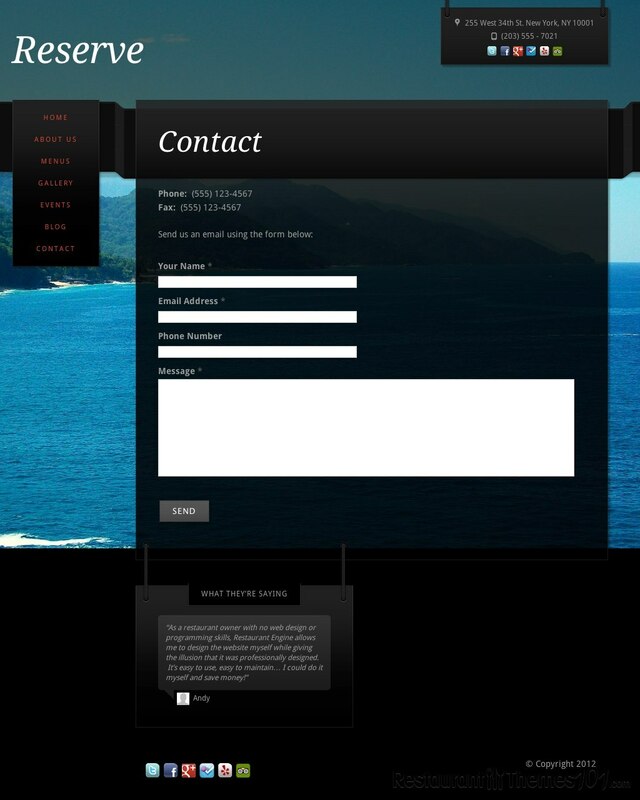 This theme is fully responsive and it will look great no matter what device your visitors are viewing it from. We all know how important it is nowadays for a restaurant website to look compact and impeccable when viewed from a mobile device and Reserve delivers exactly what you need. When it comes to the homepage of this theme, not only does it look great and stylish, but it is also very user friendly, your visitors will find their way around your website with no problems at all. Everything is presented in a good, professional way, and there are many interesting tools that will make your restaurant business look classy online. The theme features greatly built online menus where you can keep your offers presented in the best way possible, along with your own photos, prices, categories and many more. Apart from the common options many other themes have, Reserve features several special ones, too, let’s mention them. Online Reservations is one of the special features, and you can choose whether you want to use an in built form, or you can easily integrate with OpenTable.com. It is also very easy to setup and announce upcoming events with dates, maps, photos and many more details, using the Event Calendar which is a great options not many other themes offer. You can connect your social networks with the built in widgets and social sharing buttons, so your visitors can share your content anywhere they want and spread the word about your great restaurant. 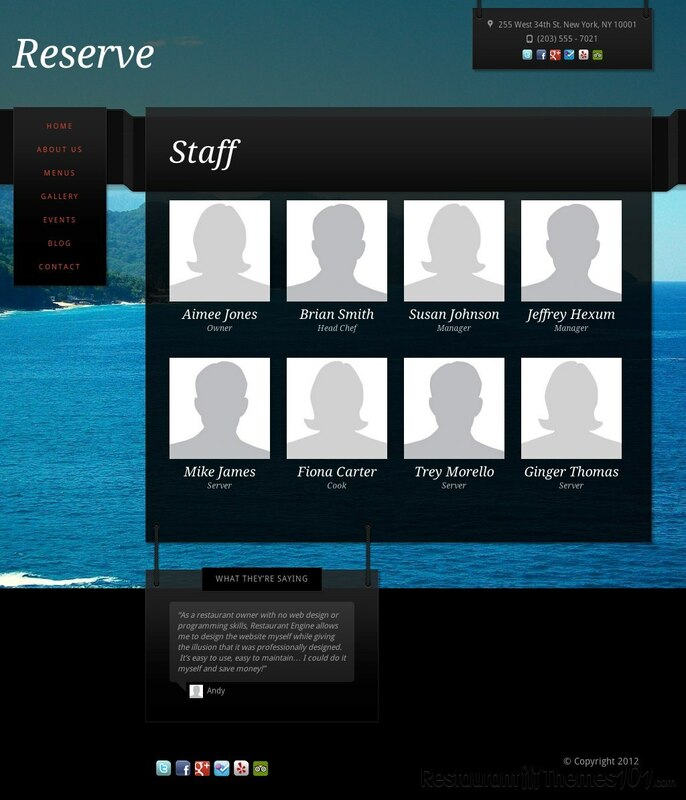 Reserve has gone one step further with this option too, as it supports Yelp, FourSquare, Twitter, Facebook and Zagat. 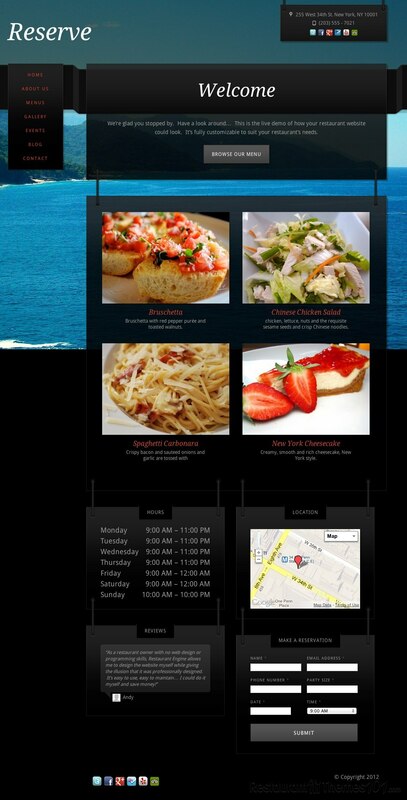 Reserve has Google Maps integrated so your new visitors will find your restaurant with ease. 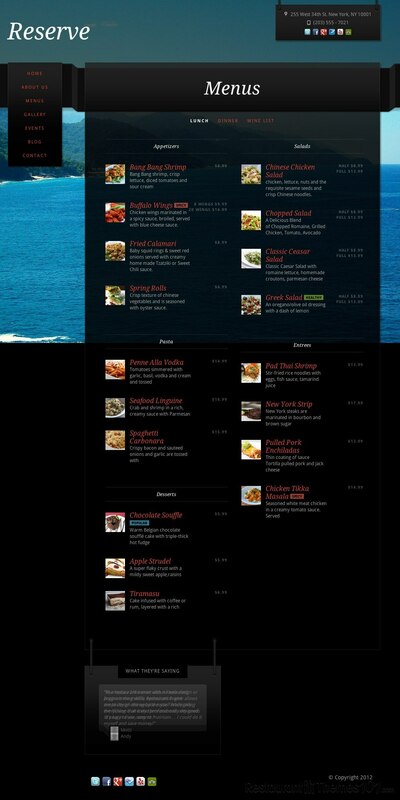 This theme offers all the great tools a restaurant theme should have, and then some.